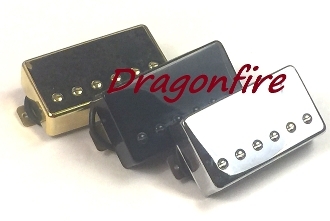 Dragonfire Vintage Buckers are passive pickups offering the ultimate humbucker for warmth and clarity. The Vintage Buckers can provide you with strong bass and strong highs. For everything from Blues to Classic Rock, these humbuckers are an excellent choice for Classic LP tone with a bit more bite. These are hot wound and boast an Alnico 5 magnet style along with bonus adjustability. The dynamic Vintage Bucker pickup features 1 row of slug / flat top style polepieces and 1 row of regulating screw style polepieces so 6 polepieces are adjustable for adaptability. Standard color and covered pickup cover styles are also available; covered styles add about 1mm in overall size. The alnico magnets in these pickups provide warm, smooth tone for less harsh and more cream in your playing.